Although named for Rhodesia, the Rhodesian Ridgeback was developed in South Africa. They were bred to hunt lions and other large game such as leopard, cheetah, baboon, and antelope in packs of two to five dogs. They hunt using both sight and smell, but were not trained to kill. Their job was to either drive their prey toward a waiting gun or to keep it at bay until the hunter arrived on horseback. Females were often prized more than the males as they tended to be more agile. The earliest history of the Rhodesian Ridgeback is parallel to a lesser-known mastiff breed, the Boerboel. Their development began with the arrival of Europeans to South Africa, specifically in 1652 when a group of Dutch East India employees founded Cape Town in South Africa (known then as Kaapstad). They were led by Jan van Riebeeck, who planned to face hostile natives and wildlife, and brought his ‘Bullenbijter’ with him. His Bullenbijter was the Dutch form of the German Bullenbeisser, which would eventually become the modern Boxer. The town grew quickly with the arrival of Scandinavian, German, French, and other European settlers, all of which brought their dogs with them. These immigrants would bring the largest, most powerful dogs they could, which were typically mastiffs. It was costly and difficult to transport dogs at the time so few made the journey. Once there many perished due to the climate, wildlife, and warfare with the natives. Originally dogs were bred with any other dog possible. European blood was preferred, but native African dogs were used as well. The native dogs (often referred to as Hottentots) included those kept by the Khoi Khoi and San peoples that resided along the Cape of Good Hope. 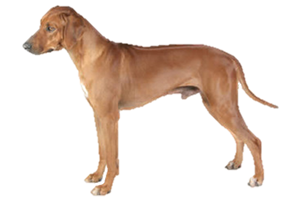 Their hunting dogs had unique ridges of fur that grew in the opposite direction along their backs, which would later become an identifying trait for the Rhodesian Ridgeback. These native dogs would also live on separately as the modern Africanis. Eventually two types of dogs emerged from these complex mixes, one with a lighter build and a greater hunting ability, and a second larger and more protective breed. The larger guardian would become the Boerboel, and the hunter would develop further into the Rhodesian Ridgeback. The Rhodesian Ridgeback's ties to Rhodesia would not take place until the late 1800s when Reverend Charles Helm visited the region. He was accompanied by two Lion Dogs and met the famous game hunter Cornelius Von Rooyen who was so impressed with their hunting abilities s that he created his own kennel. In time their popularity in Rhodesia surpassed that of its homeland and the breed became associated with Rhodesia rather than South Africa. It is interesting to note that the only other recognized breed that shares a ridged coat is the Thai Ridgeback of Thailand. There are three other breeds that remain unrecognized with the same traits; the aforementioned Africanis of South Africa, the Phu Quoc Ridgeback of Vietnam, and the Combai of India. It has been greatly disputed as to whether or not these breeds are related (and which came first if they are) or if this genetic mutation has simply occurred in various geographic locations.